When I first wrote this article, Ebola was a distant threat in a few little countries on the other side of the globe. But, now it’s here, in America. Not only are there suspected cases and confirmed cases, there’s a note of hysteria in the news. Many of the supplies I originally recommended have been sold out. So I’ve updated this article with some new information and some new resources so that you can find the supplies you need. I have added multiple sources for as many things as possible. I urge you not to panic, and to prepare calmly and methodically. If you’re new to preparedness, this may feel very overwhelming. Pay special attention to the recommended books in that case, because they’ll guide you through this situation and many others. If you’ve been doing this for a while, realize you probably already have most of what you need. Your focus should be on topping up your supplies, and being watchful. The most important thing you can do is to remain focused and purposeful. 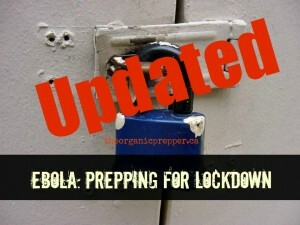 Are you prepared to go into lockdown mode if the Ebola virus begins to spread across the country? With something that displays itself as gruesomely as Ebola, with seizures and uncontrollable bleeding from every orifice, it’s unrealistic to think that a cover-up can last long. 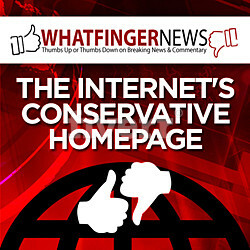 If this continues to spread, there’s no way that the government can keep it under wraps. This is NOT going to be easy to contain. The virus is spreading far more rapidly than it has in the past in West Africa, giving some people reason to believe it has mutated into something more easily transmissible. This reminds me of that scene in the movie Contagion, where the CDC experts have their quiet, closed-door meetings and discuss preventing a panic. (If you haven’t seen that movie lately, I suggest you watch it, perhaps with your older children, to open the discussion of how pandemics can spread rapidly.) In the movie, the officials seem almost more intent on keeping it quiet than they do on stopping the spread of the illness. How do you know when it’s time to go into lockdown? Avoiding contact with people who have the illness is the only way to prevent getting it. Isolating yourselves is the best way to stay safe and healthy. This is the tricky part: How do you know that the time has come to get the family inside and lock the doors behind you? Lizzie Bennett, a retired medical professional, wrote an incredibly helpful article over on her website Underground Medic. Definitely take the time to read the entire thing HERE, because this is one of the most blunt, honest things you will read from a person who worked in this field. Bennett recommends social distancing as the only effective way to protect yourself and your family from an outbreak of disease. What does it mean to go into lockdown? In the event that a member of your group becomes ill, they need to immediately be quarantined from the rest of the group. By the time they’re showing symptoms, it could be too late to prevent the spread of illness but effort should still be taken to isolate them. Here are some tips on isolating a patient. The sick room should be sealed off from the rest of the house. Use a heavy tarp over the doorway to the room on the inside and the outside. This will make a small breezeway for the caretaker to go in and out. The caretaker should cover up with disposable clothing, gloves, shoe covers, and hair covers. The caretaker should wear an N95 mask. The sick person should use disposable dishes and cutlery. All garbage from the sick room should be placed in a heavy garbage bag and burned outdoors immediately. The sick person should not leave the room. If there is not a bedroom with a connected bathroom, a bathroom setup should be created within the room. Great care must be taken with the disposal of this waste. You can learn more about preparing a sick room HERE. Do you have the supplies you need to weather a pandemic? 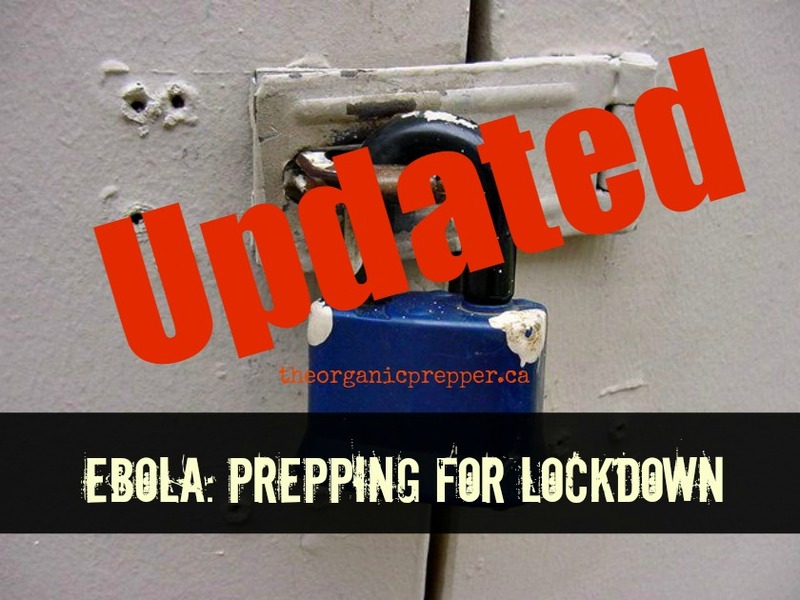 It’s time to do a last minute check of your preps because by the time a general quarantine is announced in your area or you hear the mainstream suggesting that people should stay home, it will be too late to get the rest of your supplies. As well, at that point, the path of the pandemic will have progressed so much it will be unsafe to do so. You need to be prepared to go into family lockdown mode for a minimum of 6 weeks should things get bad in your area, and preferably longer than that in the event that this takes a long time to contain. It’s most likely that services such as public water and electricity will remain intact, but you should prepare as though they won’t be, just in case. Here’s a quick checklist along with some links to resources. Base amounts on the number of family members you’ll be sheltering.